Got extra beets on hand? 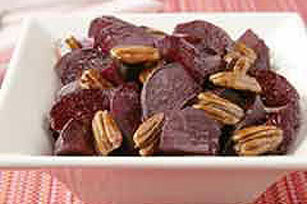 Try this recipe for Roasted Beets with Honey-Glazed Pecans. This beet dish makes the perfect side for beef or chicken! Cover baking sheet with foil; spray foil with cooking spray. Place beets on prepared baking sheet. Bake 1 hour or until tender. Remove from oven; cool slightly. Meanwhile, combine nuts and honey in small skillet; cook on medium-high heat 4 to 6 min. or until mixture is simmering and foamy, stirring constantly. Immediately spread onto baking sheet sprayed with cooking spray; separate slightly with fork. Set aside to cool. Mix oil, juice and pepper; set aside. Peel and quarter beets when cool enough to handle; place in medium bowl. Add oil mixture; mix lightly. Sprinkle with nuts. Be sure to use rubber gloves when peeling the beets to avoid staining your hands. Prepare using PLANTERS Walnut Halves.